The Atari 5200 is a vintage gaming system from the early 1980s. At the time I owned a 2600, but I always wanted a 5200. Well, in 2018 I finally decided to find one on eBay and buy it. I learned that the first thing you want to do after attaining a new gaming console is to get your hands on every available game cartridge for it, so I made this multi-ROM cartridge. 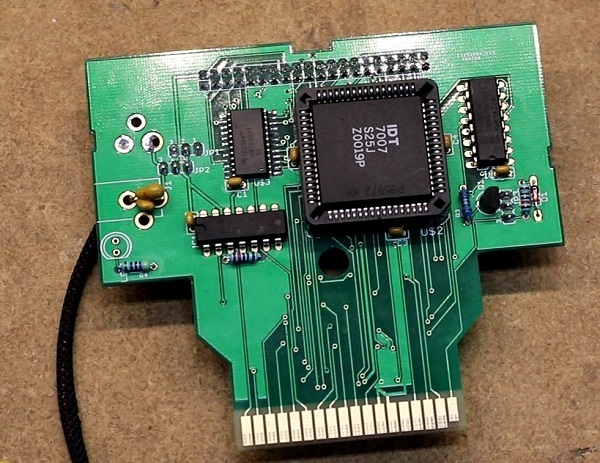 A multi-ROM cartridge, or “MultiCart” is a cartridge that contains more than one ROM image. There are multiple ways to go about this from selector switches to pick the cartridge you want, to built-in in game menu systems. I decided to go the route of using a Raspberry Pi for the user interface, making a WEB UI available to pick which cartridge is used. The goal is not simply to play retro games on modern hardware — there’s any number of emulation solutions for that. The goal is to play retro games on retro hardware, but use a modern system to load the game image into the console. See the full post at smbaker.com and the GitHub repository here. This entry was posted on July 31, 2018 by DP. A bit of background. These Wallboxes were used as remotes in diners and other locations back in the 1950s. You put your nickel, dime, or quarter into the Wallbox, which racks up some credits. Then you select the song you want and the Wallbox sends a signal to the Jukebox, which adds your selection to the queue. 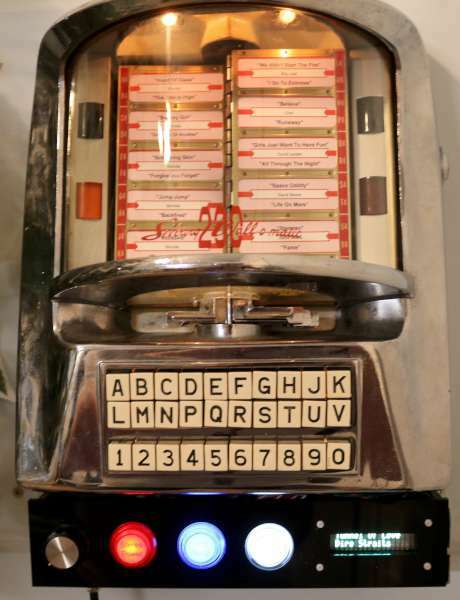 Soon thereafter your music is playing through the diner. I’m too young to have experienced these in person when they were state of the art, but I do have an appreciation for antique and retro projects. A new fad is to convert these wallboxes into remotes for your home audio system, be it Sonos or something else. I have my own homebuilt audio system, basically an augmented Pandora player, so my goal was to use the wallbox to control that. This entry was posted on April 6, 2018 by DP. This is a cpu card from a class of computers known as mini-computers. By the late 1970’s DEC was about to be eclipsed by the microcomputer. At the same time this card was in production the 68000 and 8086 16-bit class micro processors were also in the market: their superior cost would soon take much of DEC’s low end market. The card uses their FONZ-11 LSI chip set. Most interestingly the CPU instructions are micro-coded and placed into separate chips: the instruction set could be expanded at will by adding more “303E”s. Typically this would be for a floating-point instruction set. More details at Electronupdate blog. This entry was posted on March 29, 2018 by DP. 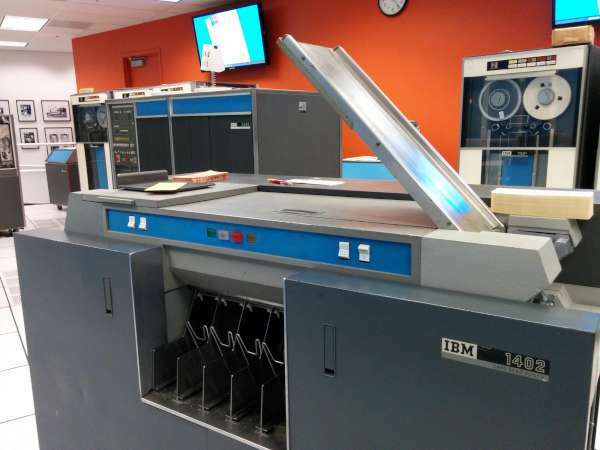 I recently helped repair the card reader for the Computer History Museum’s vintage IBM 1401 mainframe. In the process, I learned a lot about the archaic but interesting electromechanical systems used in the card reader. Most of the card reader is mechanical, with belts, gears, and clutches controlling the movement of cards through the mechanism. The reader has a small amount of logic, but instead of transistorized circuits, the logic is implemented with electromechanical relays.1 Timing signals are generated by spinning electromechanical cams that generate pulses at the proper rotation angles. This post explains how these different pieces work together, and how a subtle timing problem caused the card reader to fail. This entry was posted on February 13, 2018 by DP. FPGA-based disk control for Apple II is finally working! 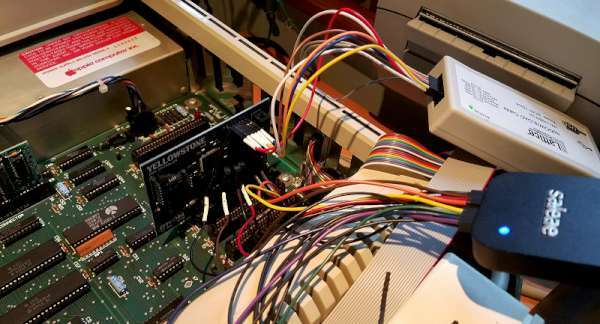 Six months ago, I began designing a universal disk controller card for the Apple II family. Apple made a bewildering number of different disk controller cards in the 1970s and 80s, and my hope was to replace the IWM chip (Integrated Wozniak Machine) and other assorted ICs typically found on the cards, and substitute a modern FPGA. 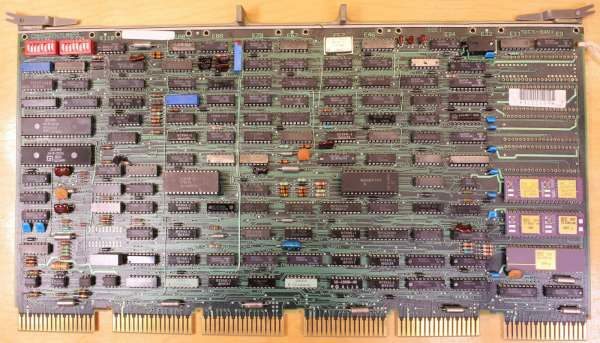 With a little luck, that would make it possible to clone any vintage disk controller card – some of which are now rare and expensive. It would also enable a single card to function as many different disk controllers, simply by modifying the FPGA configuration. With the successful cloning of a Liron disk controller, the first major step towards those goals has been made. More details at Big Mess o Wires site. This entry was posted on February 1, 2018 by DP. After a month of inactivity, I finally returned to my unfinished Yellowstone disk controller project to investigate the JTAG programming problems. 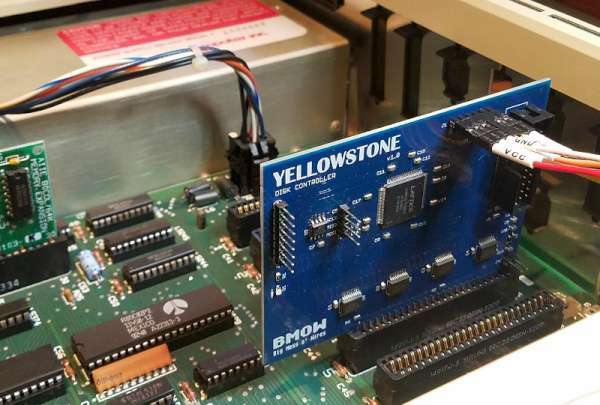 Yellowstone is an FPGA-based disk controller card for the Apple II family, that aims to emulate a Liron disk controller or other models of vintage disk controller. It’s still a work in progress. Last month I discovered some JTAG problems. With the Yellowstone card naked on my desk, and powered from an external 5V supply, JTAG programming works fine. More details at Big Mess o’ Wires. This entry was posted on January 24, 2018 by DP.